Beginning in 2014, SMAR’s Community Relations & CARE Award Committee has organized a fundraiser benefiting a local charity which helps with monetary burdens of those suffering from cancer. We thank all who participate and support such a beneficial cause. SMAR held it's "Bras & Drawers" Fundraiser on October 4th at Martini's in White Plains. 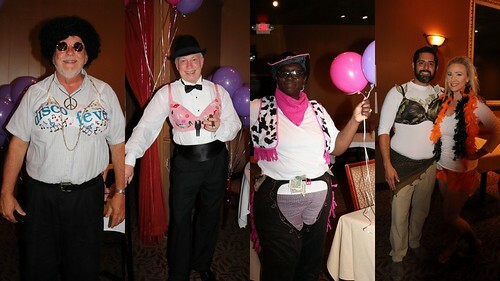 Thank you to everyone who attended to help raise money for “A Message of Hope Cancer Fund.” The evening included networking, balloon pop prizes and the highlight of the evening – auctioning off bras & drawers put on display by our fabulous models. All proceeds totaling over $5,500 will be donated to “A Message of Hope Cancer Fund.” This is the FIFTH fundraiser SMAR's Community Relations & CARE Committee has organized to benefit this local charity. A Message of HOPE Cancer Fund, Inc., a 501 (c)(3) is a non-profit organization which provides direct financial assistance to local families facing the monetary burdens associated with cancer. Assistance includes support with co-pays, prescription drugs, rent/mortgage, groceries, and gas to and from treatment. More information can be found on their website: http://www.amessageofhopecf.org/. For those who attended, we hope you had an awesome time and thank you for your support! For those who couldn’t attend, we hope to see you next year to help contribute to a wonderful cause!